To mark “Planet 21 Day” – an annual day of action by hotels to promote sustainable development – AccorHotels is announcing the roll-out of a new range of non-chemically bleached bed linen and towels in its midscale and economy hotels in Europe (Novotel, Mercure, ibis, ibis Styles and ibis Budget). The first global hotel group to offer its guests natural colored linen, AccorHotels is marking a turning point in the hospitality sector by declaring “Natural is the new white!”, as part of its overall policy to reduce the carbon footprint generated by its rooms. Arnaud Herrmann, AccorHotels Director of Sustainable Development, explained, “Through this major innovation, our aim is for our rooms to feature linen and towels that are more environmentally friendly. This project is in line with the commitment made by the Group as part of its sustainable development program, Planet 21 ActingHere, to co-innovate with its partners to develop offers and services that have a positive impact”. The new textile products have been used for over a year by the vast majority of the Group’s economy and midscale hotels in the United Kingdom. In France and the rest of Europe, hotels will phase in the new linen and towels as contracts with laundry service providers, which are generally signed for 3 years, are renewed. The main characteristic of the visually recognizable linen is its ecru color – the natural color of cotton – preserved thanks to a fabric finishing process that does not use whitening agents, such as peroxide or acid, or optical brighteners. As such, during the finishing process, cotton fiber is not subjected to oxidization, meaning that its longevity is increased by approximately 20 to 25%. To ensure the linen retains its natural color throughout its life, it is essential it is laundered properly. AccorHotels is in contact with its laundry partners in Europe to involve them in a joint discussion on the reorganization of their processes, which will also lead to environmental optimization during the usage phase. In the UK, some laundry service providers have already introduced a specific laundering method for the new range of linen and towels and have seen a reduction in their environmental impact: a 75% reduction in water consumption, and a 25% fall in CO2 emissions. In parallel, AccorHotels and its industrial partner Standard Textile have developed an innovative perfecting technology Elevation® that involves concentrating the bulk of the material in the center of the bath towel, which helps optimize the weight of the product while retaining the same quality in use and the same feel for the guest. This innovation, coupled with the removal of chemical bleaching, leads to a considerable reduction in environmental footprint: a decrease of between 45% and 52% in the environmental impact of a single towel for midscale brands, and between 35% and 45% for economy brands. 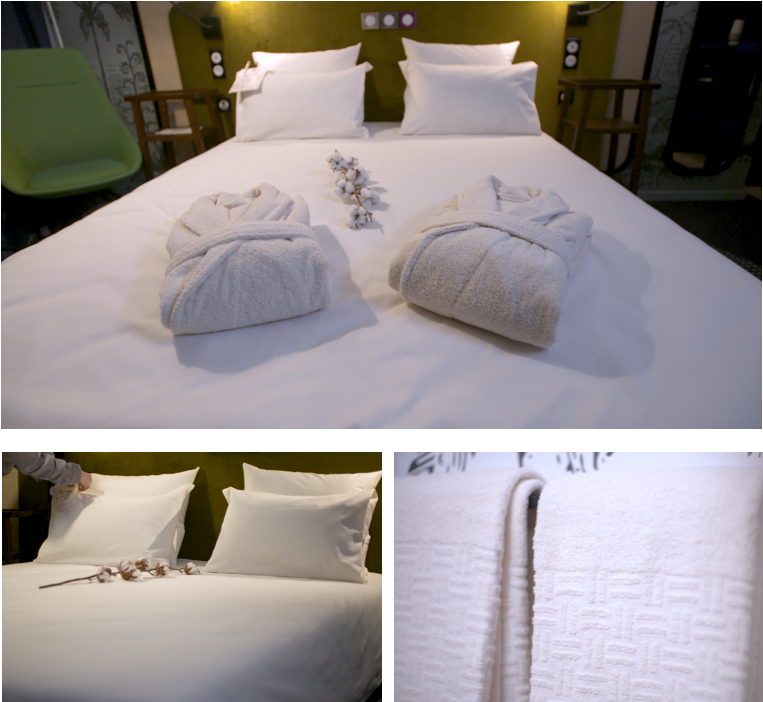 The design and manufacture of this new range of linen and towels was made possible thanks to close collaboration between AccorHotels and its textile suppliers, Standard Textile and Tissage Mouline, longstanding partners of the Group. Both companies have their own manufacturing and finishing sites in the Vosges, the textile capital of France. At Tissage Mouline, the spinning and weaving of the cloth also takes place at their sites in the Vosges. All items of bedlinen are thus made and finished in France and certified by the label “Vosges Terre Textile”, a guarantee of high quality products and recognized craftsmanship. * Assessment of the lifespan by the German Hohenstein Institute, a leading textiles research laboratory and institute in Europe. The tests conducted on towels using the same finishing process revealed that an ecru colored towel is approximately 20-25% more durable than a white towel. A 20-25% increase in lifespan results in an impact reduction of between 9 and 16% per use. The 88% reduction in the volume of chemical products used in the finishing process means a saving of up to 80% in water use, a 50% reduction in aquatic ecotoxicity and a 25% reduction in land acidification during this stage of the lifecycle. During the usage phase, the removal of bleaching agents from the detergents used will lead to a reduction in many impacts, notably water consumption and aquatic ecotoxicity. Internal test phase: guest satisfaction survey, in 14 pilot hotels in France, Germany and the UK, with a roll-out across almost 80% of hotels in the UK during 2017. All the tests conducted as well as the results of guest satisfaction surveys since the roll-out in the United Kingdom show that guests are very satisfied with the appearance and comfort of this new range of linen and towels, and support AccorHotels’ environmental initiative. The policy has also been welcomed by Group employees who feel valued and proud to be part of the project. AccorHotels CSR strategy to 2020, Planet 21 ActingHere, is based on four focus areas involving employees, guests, partners and local communities. In terms of Partners, the Group has specifically committed to leverage collective intelligence by introducing at least one major innovation each year to develop alternative and responsible models, as with the joint design of this range of eco-friendly linen. In parallel, for almost 10 years, AccorHotels has been implementing a policy of reducing the environmental impact related to the use of towels through its Plant For the Planet program. Guests spending more than one night at the hotel are encouraged to reuse their towels and half of the savings on laundry costs are allocated to planting trees. Almost 6 million trees have already been planted in 26 countries and the Group’s target is to finance the planting of 10 million trees by 2021. The roll-out of the new range of linen and towels means this policy can be expanded by continuing to reduce the environmental impact of the use of linen in rooms. In the textile manufacturing process, finishing is the treatment that gives the product its final appearance. This process involves bleaching, dying or, as in this case, preserving the natural color of the fabric. AccorHotels is a world-leading travel & lifestyle group and digital innovator offering unique experiences in more than 4,300 hotels, resorts and residences, as well as in over 10,000 of the finest private homes around the globe. Benefiting from dual expertise as an investor and operator, AccorHotels operates in 100 countries. Its portfolio comprises internationally acclaimed luxury brands including Raffles, Sofitel Legend, Fairmont, SO Sofitel, Sofitel, onefinestay, MGallery by Sofitel, Pullman, Swissôtel and 25hours Hotels; the popular midscale and boutique brands Novotel, Mercure, Mama Shelter and Adagio; much-prized economy brands including JO&JOE, ibis, ibis Styles, ibis budget and the regional brands Grand Mercure, The Sebel and hotelF1. AccorHotels provides innovative end-to-end services across the entire traveler experience, notably through the acquisition of John Paul, world leader in concierge services.